When it comes to your business or fleet vehicles, you can't afford mistakes. As a Business Elite dealer, we at Adams Chevrolet Buick GMC have a dedicated commercial and fleet team to help you with all your business/ fleet vehicle needs. We stock a diverse lineup of commercial and fleet work ready vehicles ready for sale at a moment's notice. Plus, we have the facility, tools, equipment and certified technicians to accommodate your specific service needs. You need the right vehicles, customized to your specific business needs. You need a dealer you can count on. You need every dollar to count. Whether your business needs are 1 vehicle or 100, as a Business Elite dealer, we will take the time to learn about your unique business challenges and offer you real solutions. Dedicated Commercial & Fleet Account Specialists provide you with the individual service you need. They'll work with you to get the correct vehicles built to suit your business. Each of our Specialists is an expert in their field, and each delivers a level of dedication that goes above and beyond what most dealers can offer. Express Business Services provides Priority Service and Work Ready loaners so you can carry on with your workday uninterrupted. Because we understand that when your vehicles need repairs, your business comes to a halt. 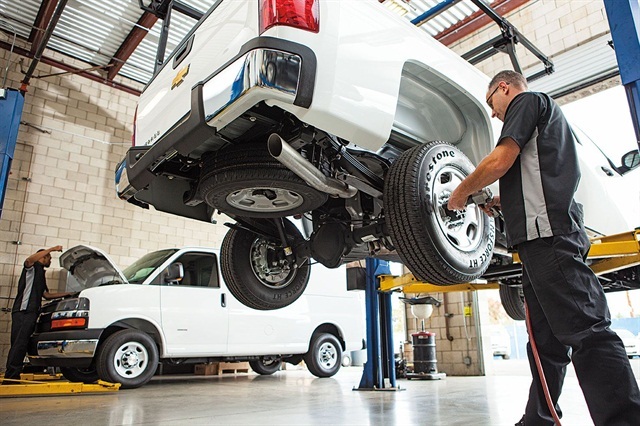 When your vehicle comes in for service you don't have to close your business because we can offer you work-ready loaners to allow your business to continue. Flexibility to choose - Not only is there a wide selection of vehicles to choose from, the program is designed to give you the greatest flexibility by providing valuable upfit and card options. *Four distinct options available. One per vehicle may be selected. Click here to contact our Business Elite/ Fleet Manager, Steve Wolbeck.